I love this new POSEUR Bestprens pose prop. There are 8 different poses total (4 for each avatar) and they can be used together (1A with 1B, 2A with 2B, etc) or mix-and-match 1A with 4B to create a whole new pose. This prop is unisex and the pose position can be adjusted via a drop-down menu. We’re so happy to take part in the first CHIC Limited event for January. 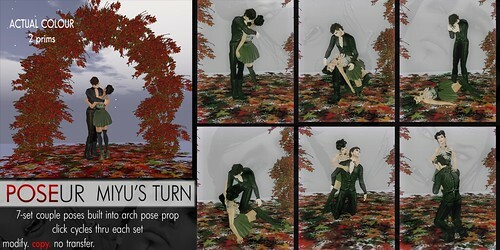 Miyu’s Turn is a pose prop with 7-set of couples poses built-in. The poses are built into a 2-prim archway with leafy ground covering, perfect for use indoors or outdoors. Poseur makes lovely poses….but OMG please can tell me from where is the brunette hair of the first pic? Sooo cute! Hi Paula 🙂 It’s the Cecile hair, from a store called Jade. It’s one of my favorite styles right now!